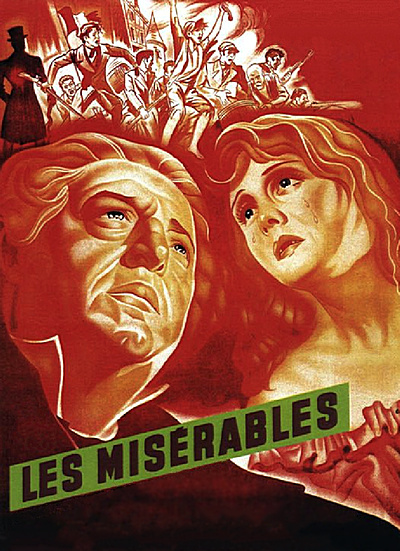 Raymond Bernard's Les Miserables is arguably the crowning effort of French studio filmmaking in the 1930s. The film's great achievement is to bring the world of Victor Hugo's 1862 novel convincingly to life through meticulous direction, acting, cinematography and production design. Released in 1934, a year ahead of the Fredric March/Charles Laughton Hollywood version, Bernard's film it's broken down into three interconnecting shorter films: "Tempest in a Skull," "The Thenardiers," and "Liberty, Sweet Liberty." By doing this, the writer/director was able to cram in as much of the original Hugo story as possible. The plot of Les Miserables is, of course, ingrained in our culture at this point. Jean Valjean (Harry Baur) was sent to prison for stealing a loaf of bread. Released nineteen years later, he finds the world turns a hard shoulder to a man of his status. An act of kindness sets him on the straight and narrow, however, and over the next several decades, he adopts multiple identities to stay out of prison and live a decent, philanthropic life. • Le Chemineau - Albert Capellani's short film Le Chemineau a.k.a. The Vagabond (1905). This film is an adaptation of the second book of Les Miserables, "The Fall". It is presented here with additional color tinting. However, it is missing the final part. (Albert Capellani also directed the 1912 silent version of Les Miserables). Silent. (4 min). 1. Archival footage from a public introduction of the cast members of Les Miserables. The event was organized by Opera de Paris Garnier on February 21, 1933. In French, with optional English subtitles. (2 min). 2. Les petits lits blanc - Gaumont Pathe Archives - Victor Hugo's poem recited by Gaby Triquet (Cosette/child). In French, with optional English subtitles. (2 min). • Deleted Scenes - a collection of deleted scenes. In French, with optional English subtitles. (3 min). • Gavroche Screen Tests - archival screen tests with young Parisian actors auditioning for the role of Gavroche. Footage courtesy of Pathe (Gaumont Pathe archives). In French, with optional English subtitles. (2 min). • Raymond Chirat - in this new video interview, French cinema expert Raymond Chirat discusses Raymond Bernard's Les Miserables. Mr. Chirat is the creator and former director of Bibliotheque Raymond Chirat at the Institut Lumiere in Lyon, France. In French, with optional English subtitles. (19 min). • Raymond Bernard - in this archival interview from 1979, editor and filmmaker Roger Ikhlef discusses Les Miserables with director Raymond Bernard. In French, with optional English subtitles. (11 min). • Victor Hugo in Cinema - in this new featurette, writer and researcher Claudine Cohen (Ecole des Hautes Etudes en Sciences Sociales) discusses Raymond Bernard's Les Miserables, its production history, and other adaptations of Victor Hugo's legendary novel (Albert Capellani's 1912 film as well as Henri Fescourt's 1935 film). Short clips from Raymond Bernard, Albert Capellani, and Henri Fescourt's films are included in the featurette. In French, with optional English subtitles. (23 min). • Theatrical Trailer - restored trailer for Raymond Bernard's Les Miserables. In French, with optional English subtitles. (4 min). Buster Keaton: The Complete Short Films (1917-1923) 4 x DVD9 and 4 x Blu-Ray Masters of Cinema – Eureka!